So I think this might be the second recipe that I have posted that BD made and not yours truly. Anyway, in our house I do about 90% of the cooking. Why? Because I am the woman and he is my man. I’m kidding, totally not true. I don’t know why really. Maybe its because I’m kind of a control freak… or maybe because I secretly think I am better than he is, but know in my heart I could NEVER cook professionally, so then he wins that argument again. (BD has professional experience while I do not. At all. Shocking, I know.) BD usually gets to cook when I say: I’m tired and don’t feel like cooking, or I have too much school work to do so you get to cook tonight. Its my gift to him really. So in an attempt to diversify, I've decided to do something new. In a not-so-shameful rip-off of some other blogs, I’ve decided to post interesting articles that I’ve come across. I’ve decided to try and do this every Friday. Why Friday? Because it starts with an F and so does food – meant to be in my opinion. The amount will vary depending on the week, but I’ll aim for somewhere around 3-5. Heinz introduced new ketchup packs! I saw several articles on this but I chose this one because I liked the author’s tone. Click here to read the article. What to know what foods to eat for better hair? Let’s face it; no woman ever truly loves their hair 100%. And since winter tends to take a toll on hair, I thought this would be interesting to know. Click here to the article. Pediatricians want the Hot Dog to be redesigned. For starters: I totally understand what they are driving at and why. Still, I just can’t imagine the hot dog any other way. Click here to read the article. I simply cannot believe February is half over already! This is simply craziness and it seems no matter what I do I can’t seem to catch up on the blog entries, homework, and the never-ending lists of boring things that need to be done. This post is way overdue. The day after Christmas BD and I traveled up north to a cold and snowy New England for a week. It’s become sort of a tradition for us, and one that we like. It’s nice to get away for the last week of the year, and I always love seeing my family. Some years we travel a lot to nearby cities like Boston and New York, or we take it easy and stay close to home. We had a long list of stuff we wanted to do this year but some reason we only accomplished a couple of them. Not surprisingly 99% of the to do list incorporated food we wanted to eat. I would have had a couple of more places to share with you, but we are really, really horrible at taking pictures. We were gone for over a week and other then the few pictures you see here, we took maybe ten photos. I joke that we need to hire someone to follow us around just so we can capture some priceless memories. Several weeks ago BD and I had some family over for a Sunday supper. We planned on making lobster ravioli in a tomato cream sauce for the main course, so I went in search of a new salad that would go well with pasta. I came across this idea and ran with it. Since that dinner, his cousin G, has asked about it a few times and I promised her that I would stop being such a slacker at posting and would get it up tonight. So somewhere in between catching up on my favorite show, doing homework, cooking dinner, and cleaning up after BD, I managed to find the time! 1. Prepare the fresh ingredients: cut tomatoes in half, red onion thinly sliced, mozzarella in bite-sized cubes, prosciutto in short strips. 2. 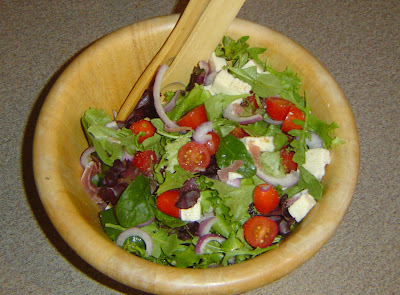 Prepare the balsamic vinaigrette: add the vinegar, S&P, and EVOO to a small bowl and whisk vigorously. You could also use one of those salad shaker things, which is what I did. I wasn’t sure who would like the Balsamic Vinaigrette so I gave everyone several choices. If I’m making a small amount of dressing I use the bowl/whisk method, but for larger amounts that I intend on serving a crowd the dressing shaker is perfect. 3. Add all the fresh ingredients to a large salad bowl and toss. 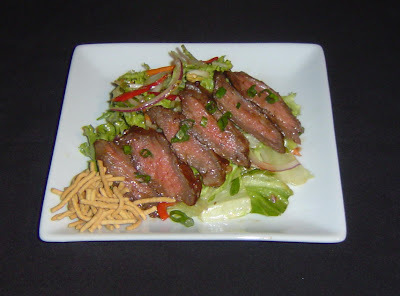 You can choose to drizzle the balsamic vinaigrette over the salad and toss together, or serve on the side. Thoughts: This salad has a lot of bold flavors but it really works well together. I think adding some sliced grilled chicken would make for an excellent entrée salad for lunch or dinner.